The mystery surrounding the fate of Australia's most famous racehorse looks set to have been solved - 74 years after his death. Scientists say that tests show Phar Lap was poisoned by arsenic while he was at the peak of his career in 1932. The legendary horse collapsed and died in agony in California, hours before a race he was widely tipped to win. US gangsters are long believed to have ordered the death, amid fears he would cause big losses to illegal bookmakers. Australian scientists used particle accelerator technology to closely analyse preserved strands of Phar Lap's hair. They concluded that the five-year-old New Zealand-bred chestnut had been given a lethal dose of arsenic 35 hours before his death. "We've made observations which could be explained by poison. We can't otherwise explain it," Australian Synchrotron Research Program scientist Ivan Kempson told local media. He said the findings added weight to the gangster poisoning theory, but warned: "You will never get a 100% definite answer". 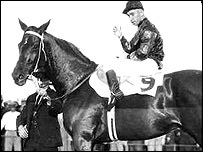 Phar Lap - which means lightning in Thai - was a sporting hero in Australia during the Great Depression era, winning 37 of his 51 starts, including the 1930 Melbourne Cup. He had won the rich Agua Caliente race in Mexico just days before his trainer found him in severe pain, with blood pouring from his lungs in California. He died hours later. Phar Lap's heart lies in the National Museum in Canberra, while his preserved body is on display at the Melbourne Museum.